When I was a little kid, my brothers and sisters and I knew that the best gifts for our Mom were the simple things...child-created artwork, hand-written lists of "Things About My Mom," coupons she could cash in for a vacuumed bedroom or washed windows...all Treasures, every one. I'm sure she still has each and every one saved to this day. Yup. Each and Every One. Because there were eight of us and she couldn't NOT volunteer to be Daisy Scout Leader, CCD teacher, Room Mom, Team Mom, carpool driver, etc. ; and because we always had a clean house, clean clothes, homework help, packed lunches, and home-cooked dinners, our mom was Busy. All. The. Time. In fact, just typing out that significantly incomplete list of things she did makes me feel like a giant heap of laziness. I'm pretty sure both my washer and dryer are full of clothes right now and I'm not doing a damn thing about it. Anyway. So my mom didn't ask for much, but there was one thing that we all knew she craved: Hot Tea. And not just, straight-from-the-kettle hot, but burn-your-tongue hot. I have memories of myself as an older kid....12, 15 years old, maybe. I'd come home from school and start to make my snack. I'd open the door to pop something in the microwave and my mom's full mug of tea would be in there....now cold. I didn't get it. I'd call to her, laughing, "Uh, Mom?! I found your tea! Want me to heat it back up for you?" I couldn't figure it out; if she loved her "hot tea" so much, why didn't she just drink it? Mommies don't have time for hot things. And now, here I am, Mommy of Three, craving my hot coffee from before I even swing my legs over the side of the bed. Some nights, the really bad nights, where two or all three of the kids require our attention at various points in the night...I find myself just wishing it would be morning. I'd happily forego my final few hours of potential sleep for the sure-thing that is that cup of coffee in the morning. And that first sip? Man, it's good. 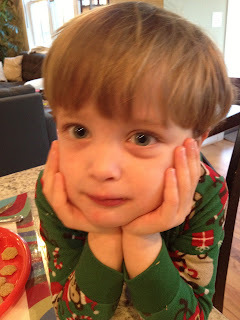 But then Kid #1 is finished with his breakfast and needs syrup washed off of his hands. And mouth. And jammies. And floor. And Kid #2 would like some more orange juice, please, Mommy? Right now, Mommy? 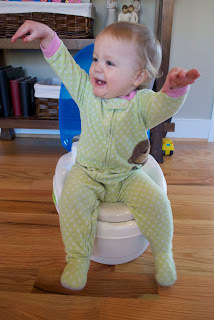 And Kid #3 has created a virtual minefield of smooshed bananas and soggy Cheerios around her high chair and is raising her arms and shrieking in the universal sign for All Done! And backpacks need to be packed and diapers need to be changed and big boys need to be sent out to the bus stop and games need to be played and books need to be read. And suddenly, it's 8 am and you reach, at long last, for that cup of coffee. By now it's cold, so you bring it over to the microwave and heat it up. 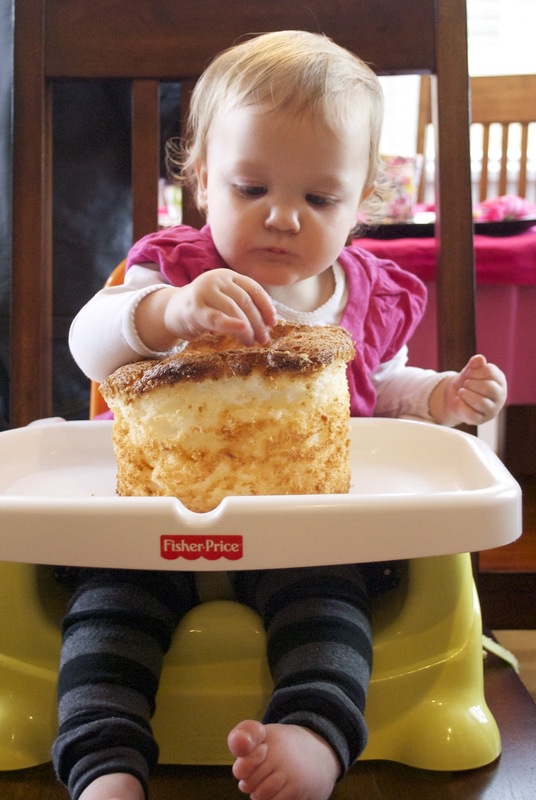 But then it's time to distract the baby away from her brother's block tower and it's time to hustle that newly-potty-trained kiddo in to the bathroom and it's time to get the littles dressed, throw your hair into a pony-tail, pack snack and a change of clothes into the preschool bag, and change another diaper. Then hurry into shoes and coats and hats and gloves and carseats and it's off to preschool we go. And then it's 9:00, you and the baby are home again, and you're eyeing that microwave. But now the baby needs to be nursed and the laundry needs folding and that block tower is toppled and strewn across the entire first floor of your house and, even though you tell yourself not to, that this is not *your* job, you clean it up anyway. And then you start the microwave again, and this time, you wait for it. And, if you're lucky, you drink every last drop. My mommy friends and I will sometimes convey how hectic a day has been by how many times that first cup of coffee was microwaved before it was finished. "Man, it was a three-times-in-the-microwave day today!" she'll say. "Sheesh!" I'll answer, "I was lucky today! I gulped it down while it was still hot! I was standing at the kitchen sink and unloading the dishwasher with the other hand and trying to ignore the brothers fighting over which episode of Doc McStuffins we'd watch while drinking it, but at least it was still hot!" Remember those mornings when you'd pour yourself a cup of coffee, toast a bagel, and flip on the Today Show for a few minutes before you'd get yourself, and ONLY yourself, ready for work? I kind of do. And, sometimes, I miss those mornings. But mostly, I like the chaos of our morning routine and don't mind saving my Hot Coffee time for nap time. Which, by the way, I just finished. And it was delicious. Every month, Disney's Family Fun magazine shows up at my house. I'm not sure that I ever signed up for it, but, nevertheless, it appears. And every month, I flip through it and skim the articles promising to remember some of the craft ideas for a rainy day and rolling my eyes at the helpful "tips" that seem to be present in every parenting magazine (you know the kind of brilliant advice I mean: "To get your child to eat healthier, involve him in the process of shopping for and preparing the vegetables!" Please.). 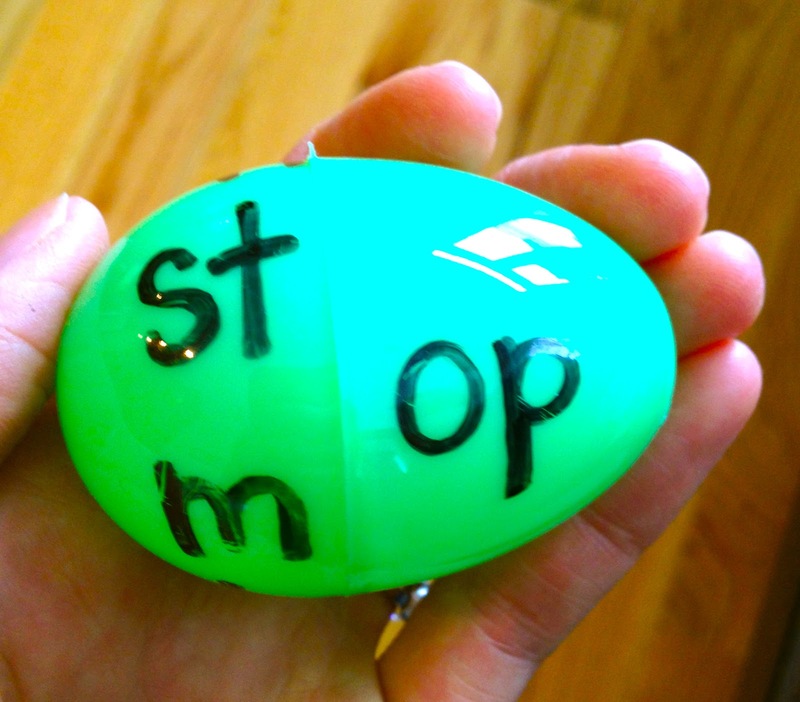 While thumbing through the latest issue, however, I was reminded of an activity I had made for my kindergarteners when I was a teacher but had completely forgotten about...Easter Egg Word Families! On the taller side of each egg, write a word-family ending. I used the following: -at, -an, -en, -et, -in, -ing, -op, -ock, -un, and -ump. Then, on the shorter side, write beginning consonants or blends that, together with the word family ending, make words. To play, have your child read the first word, then twist the egg to make a new, rhyming word. 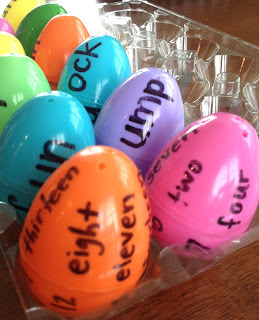 To complete our dozen, and to add a little variety, I also made two number-word eggs (1-7, 8-15). 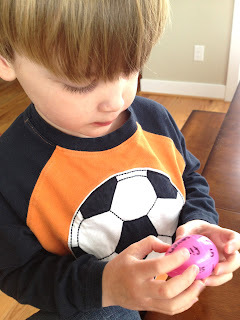 Play similarly, matching up the correct number with it's number word. Max loves this game. It's just challenging enough to be fun without being frustrating. Evan plays, what he calls "The Challenge Round." 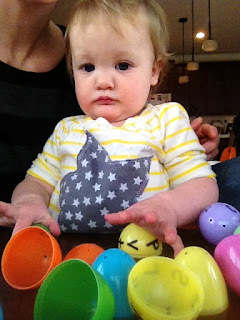 He mixes up "wrong" egg-halves, making nonsense words like "spump" and "thock." It's, apparently, really funny if you're a kindergartner. Doesn't she do a great "What?!" face? She's going to be a fun tween. 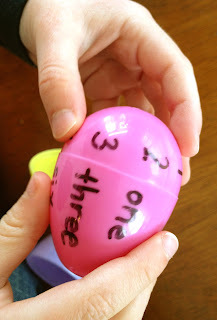 So go make a quick and easy reading/egg-breaking game for your kiddos! Best part? You can't walk into any store right now without finding an Easter Egg display staring you right in the face...so no excuses. I read somewhere (fine, it was in Us Weekly) a quote from a new mom (fine, it was Drew Barrymore). She compared motherhood to having the worst crush ever. When you've been away and you're on your way back to be with your baby, your heart is fluttering and you can't get there fast enough. You're wondering, hoping, that she'll ask you to spend the night. 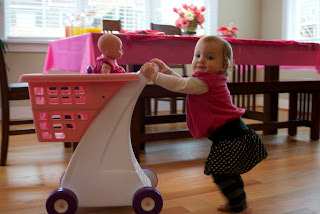 I'm not apart from Molly much...I think I've gone to the grocery store without her...once...? But this girl's got a hold on me even when we're together. And that crush? I've got it bad. Now that she's sleeping in her own bed, I'll go in to check on her before I go to sleep. Seeing her sleeping in her crib...so peaceful....so all alone....it takes everything I have to resist picking her up and snuggling her. I don't, because I, ultimately, want to sleep, too...But knowing that I won't see her until 4am (or later!) breaks my heart just a little bit. 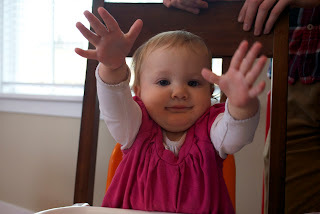 When it is time for me to go and get her, she reaches both arms up to me and says, with a sigh of relief in her voice, "mah-ma!" As soon as I scoop her up, she lays her head on my shoulder and her face buries into the hollow of my neck. She holds onto my shirt in both of her little fists, and wraps her legs around me. She lets me bring her into our bed where she scoots up close to me and, if we're lucky, eventually falls back to sleep. It is this daily nightly ritual that I want never to end. There's so much that I'm looking forward to in the weeks and months and years to come as she grows. I can't wait for her to start talking. I can't WAIT to see her run around with her brothers this summer. I am on the edge of my seat wanting to know if she'll be a total girly-girl princess or a rough-and-tumble tomboy or, probably, something in between. But that part of our day night when there's not a hair's breadth of space between us, and her sweet baby breath leaves a warm spot on my chest? Those days are shortly numbered. And I'm starting to miss her already. But I won't get ahead of myself. 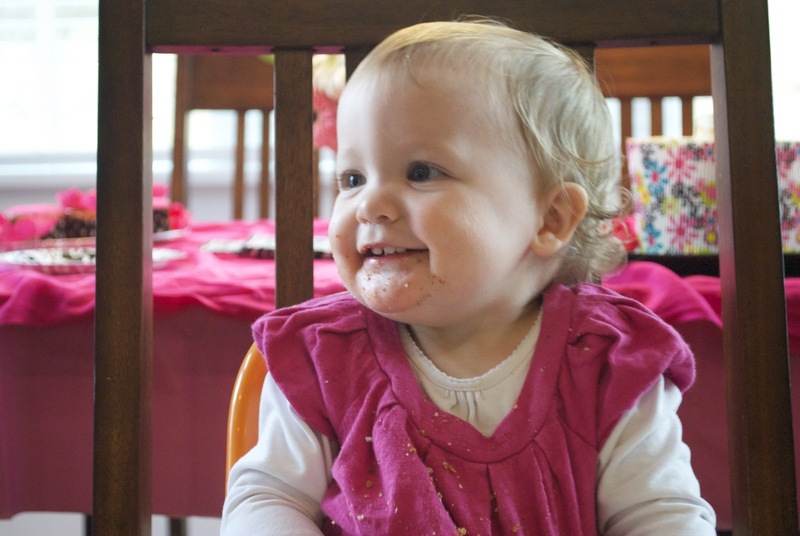 And I won't be staring, wistfully, into the rear-view mirror of her first year too much. Right now, it's time to celebrate this girl. In this moment. 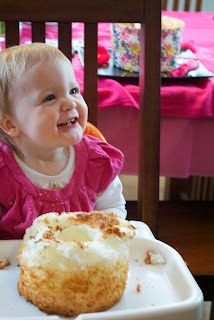 My beautiful, bright-eyed, curly-haired, funny little One-Year-Old lovey. I love how she still sleeps in my arms. Her naps have been all over the place lately. She's transitioning out of needing a morning nap, but she often falls asleep during preschool drop-off which completely throws off her afternoon nap. So, when she won't let me put her down for a nap in her crib, I'll happily hold her and let her doze while she nurses. I love watching her sleep. And if Pop happens to be here at nap time, all he has to do is pick her up. She melts into him and just drifts off. They're napping buddies. I love how she toddles over to me the minute the music, any music, starts. 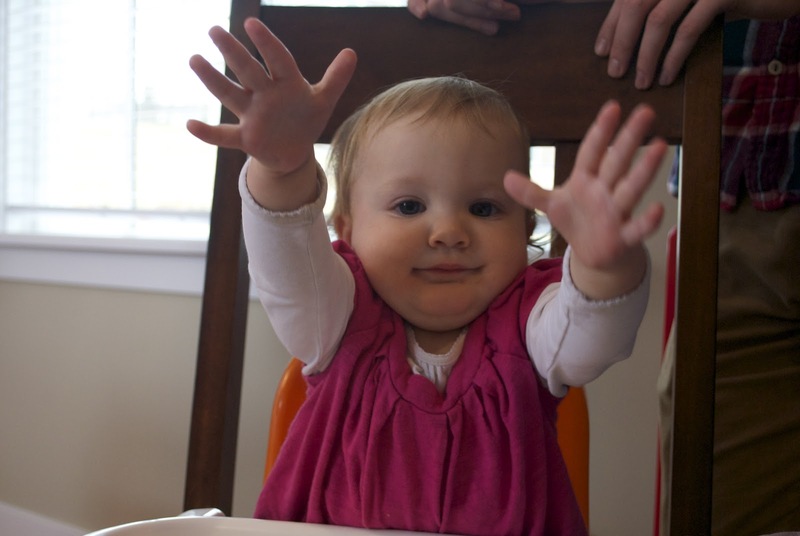 She raises her arms for me to pick her up and she perches on my hip while we sway in time. If I pause for a moment, she scoots in my arms until I start dancing again. I even love, though admittedly less so, when, while we're dancing, she spies Uncle Mike enter the room. She practically lunges out of my arms to him. They're dancing buddies. I love how she's such a Little Mommy. She LOVES her buddies. 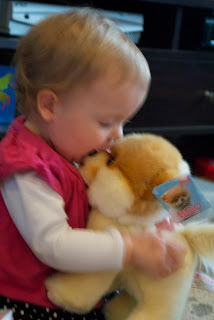 She kisses them and takes them for rides around the living room. My favorite, though, is when she gives her baby a hug. She brings the baby up to her shoulder and rests her head on it. She squeezes the baby tight and kicks her little feet out with happiness. Then, she looks up to see who's watching her be such a sweet and adorable little mommy...because we all always are. We are a dedicated audience to this girl. The boys can't get enough of her because she can't get enough of them. She wants to be included in all of their games, even if that just means toddling after them as they race through the kitchen. But if she happens to grab a game piece and one of them tries to get it back? You'd better watch out. This petite little thing can summon her inner Dragon when she needs it. She straightens her arms and clenches her fists. She throws her head back and squirms up her face into a look of obstinate determination. She shrieks out a cry of defiance, and then immediately looks at you to see if you've given her her way. She's testing...and it's hilarious. And she's not only funny by accident these days. I love watching her sense of humor develop. She is playful. She is smart. And even she is not above potty humor. They loved it. Still do, actually. Max wore the pink "ear muffs" just this morning! I honestly didn't think my kids were ever going to play with it the way it was "meant" to be played with...so I didn't even bother modeling it for Molly. 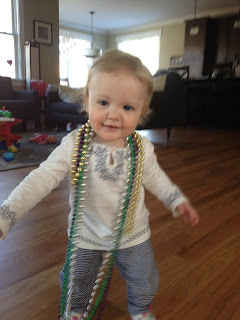 Instead, I put the rings on her arms like giant, squishy bracelets. She thought it was silly. Then we put the toy back together. She immediately dropped in a ball, danced to the music that the ball-dropping produced, and reached for the next ball. She played with that toy for a solid four or five minutes. 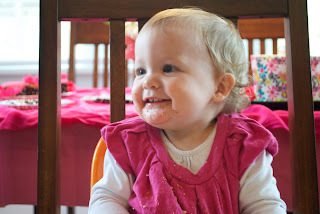 I love noticing how very different this baby girl is from her big brothers....and I love noticing the little similarities that they all share....those things that define them as siblings....as Family. But most of all...I love how this little girl perfectly fills up that last little bit of my heart that was just waiting for her. She completes this Family, and together, we are Just Right. Happy First Birthday to my sweet, beautiful little Dragon Lady. You are so, so Loved and we are the lucky ones to call you Ours. Yesterday, Sam walked into the kitchen, where I was getting lunch together, and dropped a bombshell on me. "So, Max just told me that tomorrow he's going to package up his binkies and mail them to the new babies in the hospital." I looked at him, surprised, to say the least. No. I was shocked. Not because of where he wanted to send his binkies to....we had used the same method to encourage Evan to get rid of his binkies when he was we were ready to say good-bye. 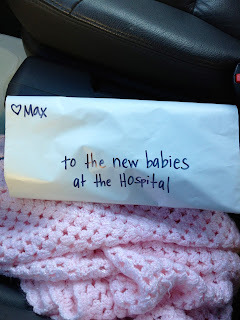 We had told Max this story many times: "Someday, when you're ready, you'll mail your binkies to the hospital where babies are born. 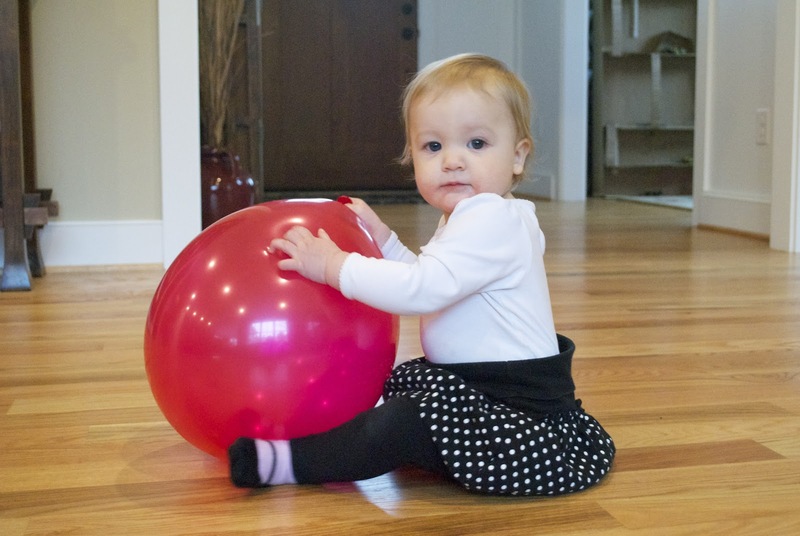 Think of those sweet, tiny babies who will be so happy to have binkies to help them sleep on their very first night." He never participated in the conversations...and we had stopped talking about it. We are, after all, conquering a much larger beast at the moment. We were shocked by the fact that Max was Ready. And of his own volition. We knew we should probably capitalize on the occasion. "So, Max....is today the day that you're going to package up your binkies and mail them to the new babies?" "Um....Yes?! Yes, I AM. I....AM....ready. To. Send. mybinkiestothenewbabies." "That's great, buddy!" I said, "Just bring them to me whenever you're ready and I'll help you." And then we dropped it. We didn't want to force his hand. It wasn't, after all, our decision. If he wanted to reconsider, we'd have been okay with it. "Um, Mommy?" he started, a few moments later, "Why are your eyes watery? Is it because they're full of happy tears?" "My eyes aren't watery, Max. Are yours?" "Um. Yes. Because they're full of HAPPY TEARS. Because I'm SUCH A BIG BOY to give my binkies to the new babies!" "Mommy?" he interrupted. "Can you come give me a really big hug?" Oh, my brave little love. I hugged him tight and didn't mention binkies again. After breakfast, he gathered all three binkies from his bed. I got an envelope. We addressed it together. And Sam took it and "mailed" it at the trashcan-looking "post office" at work. There are going to be some happy, pacified little babies at bedtime in the hospital tonight! Wouldn't you know....if you wait long enough, they really do just grow up all on their own. 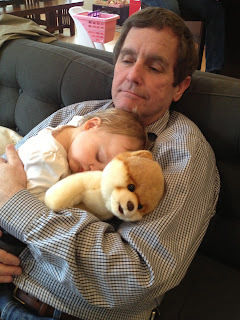 But, man, did I miss naptime today. Instead of cuddling up with his binky and buddies and sleeping soundly for his standard hour-and-a-half long nap, he sat on his bed yelling down to me that he wasn't tired and was all done sleeping and wasn't going to take a nappy today at all ever again. He fell asleep soundly, before 7 pm, without a binky and without tears. Sweet, big boy. "I spy with my little eye something that is so huuuuuuge to top of the sky..."
It's the mountains we were driving between. "I spy with my little eye something that is beautiful. So so so so beautiful..."
"I spy with my little eye something that I can only see in my imagination but it's a wonderful place at the top of the globe..."
"...something that is tall and pointy in the winter but big and green and leafy in the summer..."
"...something that is all fire-y and warm and in some people's houses but not ours..."
The valley below the mountain road we were driving on. "...something that is a line. And it's in the sky. And a jet made it. And it's smokey..."
The trail of smoke that follows behind a jet. "...something that is white and fluffy and just lovely...."
When we play I Spy, I see the world like he does.